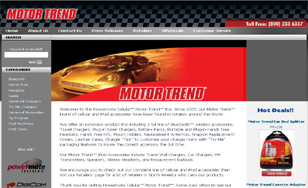 Motortrend sells motor/car cellular telephone parts. Due to the extremely competitive nature of this business they decided to have an online store to expand their reach and increase their business. The New York website design by Bitochon feature an Ecommerce store that allowed Motortrend to showcase its products nationwide. Customers can browse, shop and pay with credit card 24 hours a day. The website features an easy-to-use administration interface so that revisions can be made to content and products can be added or replaced as needed.